SPOTLIGHT : Miniatur Wunderland – A journey from Christmas Village to Las Vegas! Take a ride from the cab or a window seat on one of the finest model railroads in the world. The Amtrak F40PH 39 is riding from the Christmas village, through the Redwoods, the Grand Canyon to Nevada’s famous desert metropolis Las Vegas. Located in Hamburg, Germany and one of the most popular tourist attractions ever, this could be the worlds largest and most amazing model railway. Covering 1300 square meters, the railway receives more than 1 million visitors a year. It’s made up of 8 distinct sections and has over 13 km of track. Sections feature scenes of Scandinavia, Germany, Austria, Switzerland and the United States. Each day 900 trains and 12,000 rail cars (wagons) travel several hundred kilometers. There’s cruise ships on the seas, a working airport with aircraft taking off and landing that took 6 years to complete. Countless computer controlled vehicles move about fully animated scenes, including firetrucks battling blazes and Police ticketing speeders. More than 200,000 figures show life in all its facets. Truly an amazing display with hundreds of treasures in the details waiting to be discovered. Take a walk around tour of one of the largest and finest model railways in the UK! This magnificent O scale (1:43) 2-rail tinplate layout features up to 30 trains running through 17 stations which have a grand total of 52 platforms. Roy James’ layout is 30 feet by 50 feet in size (1500 square feet), housed in five sheds. The railway is loosely based on London’s railways and consists of various lines operating in and around London, featuring various liveries that cover more than four decades of prototype operations, that range from the period of nationalization to privatization of British Railways. The railway attempts to display most of the popular classes of both diesel and steam locomotives of that period. If you’ve never watched the movie, or even if it’s been a while, enjoy the wild ZW-propelled ride and fiery crash at the end ! Gomez Addams takes his Lionel fleet to full throttle. Lionel trains were sometime featured in episodes of the original black & white television series that launched on September of 1964. Here’s the iconic scene from the first episode aired in 1964, where Gomez takes his hands of the big ZW to press the detonator and blow up the bridge. A steam engine, F-3 diesel and GP-9 diesel crash in flames. 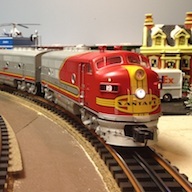 Click here to visit the Canadian Toy Train Association’s YouTube video channel! 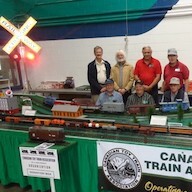 The videos here are from our members, and reflect all aspects of our love for Canadian Toy Trains. Enjoy these . . .
View our ‘Playlists’ for compilations. The videos presented in these topical playlists here are some of our favourites. They have been viewed, enjoyed and recommended by CTTA members, and are publicly available on YouTube. 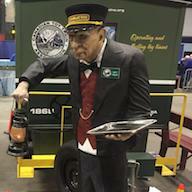 Ride along in the cab of the locomotive and take a grand tour of Mark Horne’s amazing O Gauge model train railroad! In this series of 7 videos, Mark has placed a GoPro camera on a flatcar and run the trains around all of the routes both ways. A variety of colorful cylindrical and smooth side covered hoppers make up this 30 car prototypical freight. Take a track-side break as this long 30-car freight train rolls by. This huge grain train features covered hoppers from all the major manufacturers. Then, a BC Rail freight comes by the other way. The Lionel SD-40-2 locomotives on the point feature Legacy Railsounds and diesel smoke in the power unit. At the front of the CN train are 3 large boxcars, 2 Atlas ‘O’ and a Lionel car. 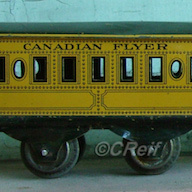 The first 13 cars of the grain train are prototypical accurate cylindrical hoppers lettered for the Government of Saskatchewan, Alberta and Canada. They are a mix of Lionel and MTH Premier cars. After that comes another 13 Weaver Ultraline grain cars made in the mid 1990’s from 4 different sets. The paint schemes on these cars are prototypical, but the railcars they’re applied to are not. These Weaver cars were by custom runs, decorated to be sold by several hobby shop dealers in the US and Canada. These cars were probably the very first to display the colorful Canadian grain and potash schemes. Coming the other way is a British Columbia Railway mixed freight. The locomotives are also SD-40-2 models, MTH Premier models with Protosound 2.0. The consist starts with a string of Atlas ‘O’ and MTH boxcars, followed by a string of freight cars custom decorated for the CTTA. The Bulkhead flatcar and tank cars are Atlas ‘O’ models, the White Pass & Yukon Trailer on Flatcar is the last custom decorated car produced by Weaver before they closed in 2015. The Joy of Train Sets – The Model Railway Story: From Hornby to Triang and beyond, this documentary explores how the British have been in love with model railways for more than a century. What began as an adult obsession with building fully-engineered replicas became the iconic toy of 1950s and 60s childhood. With unique archive and contributions from modellers such as Pete Waterman, this is a celebration of the joys of miniaturisation. Just don’t call them toy trains. 1955 Comedy Documentary! A wall-to-wall Lionel O-Gauge model train layout and an obsessive collector – Joe McDoakes – leads to a number of comical situations. Disappearing S Gauge train – a fourteen foot long train disappears into a 4 foot long tunnel. This layout has been built for a couple of years but just had scenery and detail added this year. Numerous people just walk past the layout at shows thinking it is a train going thru a tunnel on an oval layout. Those that actually stand and watch it for a few minutes realize that it disappears and the smiles come!